CB Supplies offers the necessary controls, installation accessories and tools for simple to complex multi-zone hydronic systems. 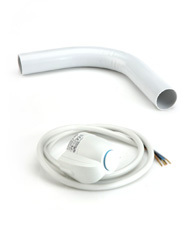 These industry standard components are compatible with all water heating units and circulating pumps. These products combined with CB Supplies easy to use design software guarantee maximum system efficiencies and maintain the costs of radiant floor heating at their minimum. CB Supplies also offers professional design assistance when needed.